I was so worried about getting my Mother-in-law's birthday card done and in the mail to Scotland to arrive on time for February 2 that I almost forgot our neice's birthday which is January 31. She lives outside London, so it needs to get into the mail as well! This idea came from the overlapping sentiment on my MIL's card. 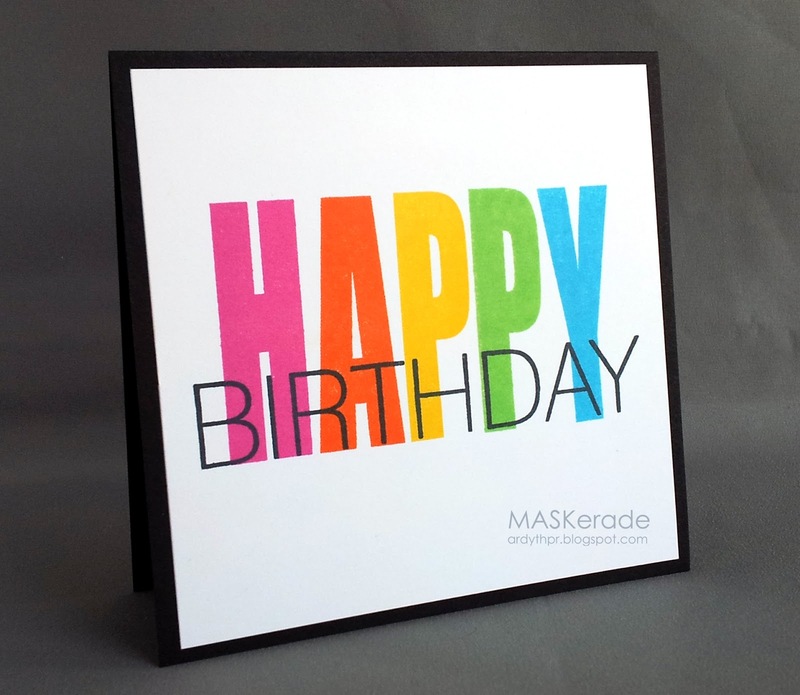 I love the big bold colours (My Stamp Box Tall Solids Alpha) and the overlap (Uniko All Occasions Sentiments #2). Love the overlapping of the black on color! Love this - so graphic and perfect. I love how the overlapping sentiments ground the sentiment. Very cool! Classic Ardyth right here, folks! Great color, perfect stamping. What else can I say. Oh, this is simply, perfect! :) Love! i love the bold colorful stamp paired with the clean lines of the smaller font. GORGEOUS! The colors really do scream "HAPPY", love it!!! Yes, absolute stamping perfection...something we have come to expect at every visit! Achieving flawless ink coverage in large images in NOT an easy task...and you repeated it 5 times!!! The "Birthday" stamp is the perfect match! You are amazing! This is so bright and happy. And, I just love the way you overlapped your letters--how did you ever get the spacing so perfect. I must say that the title of your post made my heart skip a beat when I saw it in my Feedly--my first thought was that I missed my stamping friend, Kara's birthday. Fabulous! I love this card, Ardyth! So bright and fun! Hi Ardyth - LOVE this card -just amazing! Thanks for increasing the STAMPlorations sales :) - can't wait to see what you create with this amazing little set! Ardyth, such beautiful stamping. Love that overlapping font and such perfect placement! I cannot get enough of this card, Ardyth! Awesome!